The Los Angeles Rams took an early lead and never lost it, defeating the Arizona Cardinals 32-16 at University of Phoenix Stadium. QB Jared Goff was fairly efficient on the day, throwing for 7.1 yards per attempt on the way to 220 yards. RB Todd Gurley accounted for 84 of those yards, with another 74 on the ground as well. QB Blaine Gabbert threw two interceptions, but his play has not slowed WR Larry Fitzgerald. Fitzgerald caught 10 passes for 98 yards and a score. RB Kerwynn Williams had a big statistical day, running for 98 yards on 16 carries. 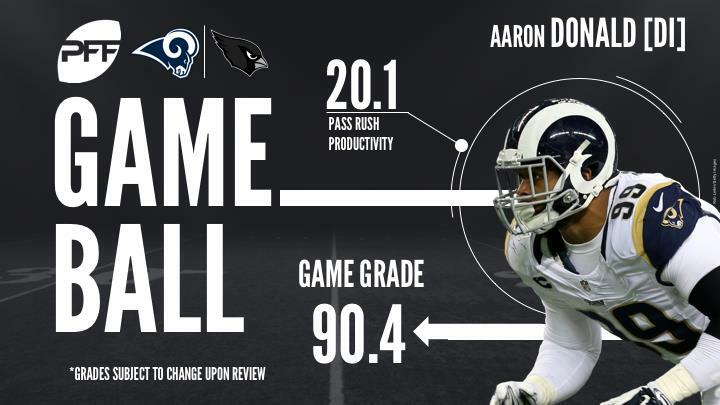 DI Aaron Donald was a big part of stopping the Cardinals, picking up two sacks and more pressures, and K Greg Zuerlin did his part, making four field goals on the day. With that, we give you our PFF-exclusive takeaways from the contest for each team. By far the best performer on offense for the Rams was Todd Gurley, who was running hard despite modest production on the ground. He gained 74 yards on 19 carries (3.9 yards per attempt), but 56 of them came after contact and he broke five tackles to get that much. As a receiver he chipped in with another 85 yards on six receptions, including a big screen pass at a critical moment. It was another week of disruption from Donald, who finished with two sacks and seven hurries on his 38 rushes. He fought through a double team on his first sack early in the third quarter, while his second sack was an incredible finish as he knifed past LG Alex Boone and reached out to drag down QB Blaine Gabbert. Beyond that, he had a number of quick wins that didn’t show up on the stat sheet, but clearly show just how difficult he is to block on a weekly basis. Joyner kicked off the game with an interception on a poor underthrow by Gabbert, doing a nice job of tracking and hauling in the errant pass. He made his presence felt over the middle of the field throughout the afternoon, getting in on a late pass breakup on a seam route while being in good position to lay the wood on a Gabbert overthrow on the opposite hashmark. Joyner did whiff on a downfield tackle against RB Kerwynn Williams, but other than that, it was a clean game and he made a big impact in coverage. It was a rough start for Gabbert, who threw an interception on his first throw of the day, a poorly underthrown deep crossing route, and followed it up with a pick-six on the next drive, though that was more of a good play by LB Alec Ogletree than anything Gabbert did wrong. Gabbert found some rhythm in the middle of the game, with a well-placed touchdown to WR Larry Fitzgerald and a number of other key first-down conversions, but overall, Gabbert left too many plays on the field, including a potential touchdown early in the fourth quarter. He finished just 1-for-8 for 26 yards and an interception on deep (20-plus yard) passes. Fitzgerald caught all 10 of his targets for 98 yards and a score, and while there were a few late, easy receptions in there, he once again showed that he’s reliable when needed to move the chains. He went up to catch his touchdown on the post while showing some shiftiness after the catch with three forced missed tackles, though one was negated by a penalty. It’s Fitzgerald’s fourth game with at least 10 catches this season, as he continues to be one of the league’s most dependable receivers. He wasn’t exactly a force all game long, but to get any change out of Andrew Whitworth is an achievement, and Chandler Jones beat him for a clean sack, which he then added interest to by stripping the ball from Jared Goff as he made contact, only to see Whitworth fall on the ball to prevent the turnover. Jones also notched a hit and had three defensive stops overall. It wasn’t all good for Baker, but he was incredibly active in this game, and had his fair share of outstanding plays to go with some given up. He led the team in solo tackles (eight), but just two of those were defensive stops, and he gave up some critical plays in coverage, but his instincts and ability to get around the football was once again on display.